frog cottage designs: Who doesn't love a reindeer? Who doesn't love a reindeer? Finished another stitchery yesterday, another one to do.....I see some of the Christmas In July pressies are already arriving....better get a move on! Enjoy your day whatever you are doing! He's very sweet Deb....maybe I should be digging out the red threads too. Cute little reindeer - yes I have noticed some of the xmas in July swaps have been posted - will have to get a move on and finish mine also!! So cute Deb, of course we all love a reindeer! Your reindeer is very cute Deb. I've just got to take photos of my Christmas in July gifts and wrap them up! 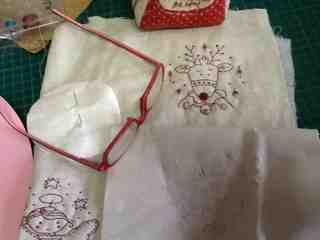 Happy stitching Deb...your glasses match the reindeer! Its the 25th.....Ive opened my pressies!!! Im off to a sewing day!!! !